Sikhs in the diaspora should consider preserving selected historical places connected to the Sikh heritage in Pakistan rather than pouring money into slapping marbles at gurdwaras elsewhere. “We have money in the diaspora. 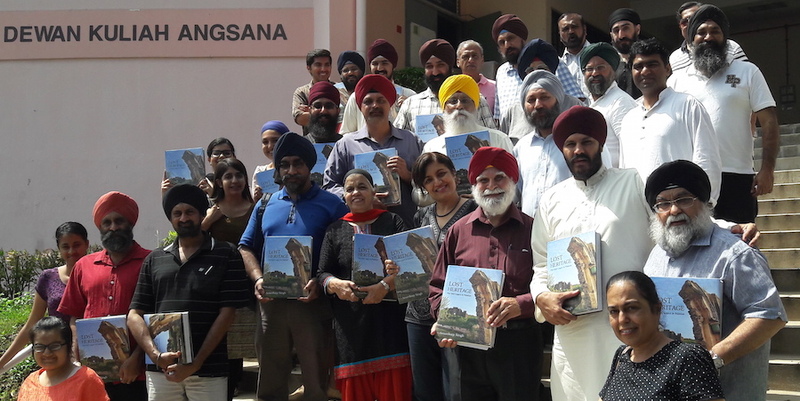 We should get local [Pakistan] artisans to do the job, and not bring the Babas from Punjab… they will destroy it,” says Amardeep Singh, author of the recently-released Lost Heritage: The Sikh Legacy in Pakistan, at the launch of the book in Kuala Lumpur today (23 Jan 2016). “Later, we can develop a heritage trail,” adds the Indian-born Sikh who is now a Singapore citizen. Amardeep, 49, had dedicated the last one-year towards producing the book. It came about by chance when he embarked in a quest in 2014 to connect with his family roots in the Pakistan side of Punjab. Amardeep, who had been in the corporate world for 25 years, left American Express in 2013 as the head of regional revenue management. He was then based in Singapore. The hard-bound 492 page book captures his journey to some 36 towns in Pakistan in 2014 in text and photography. Written in a travelogue-style, Amardeep went beyond the usual ‘functional’ gurdwaras at Lahore, Nankana Sahib, Hassan Abdal, Kartarpur and Eminabad. Many of these sites are at present almost off-bound to Sikhs, who had mostly migrated towards East Punjab in today’s India after the partition in 1947 that saw the creation of Pakistan. “In the communal riots that ensued, Punjab was bloodied, partitioned and wrenched from its secularity. Polarised, the Punjabi Sikhs and Hindus had their umbilical cord severed from the land of their forefathers and forced to migrate eastwards,” he writes in the preface of the book. Amardeep has been on a tour to promote the book. He had just completed a tour of a number of cities in Australia. A launch for Singapore is scheduled for 30 Jan. In the course of the launches, Amardeep notes that most Sikh youth are generally unaware of the Sikh heritage on the Pakistan side of Punjab. “We are brainwashed to think that our hertage is just that – Nankana Sahib, Panja Sahib…Punjab is 80 percent in Pakistan. But our youth today are not aware of it,” he said. The same goes with the Paksitan authorities. He hopes that Sikhs in the diaspora will conduct more engagements with the Pakistan authorities. “I’m hoping engagement with the Pakistan government will result in something more – we need heritage beyond mere pilgrimage,” he said. One interesting aspect of the the Sikh empire, including when under Maharaja Ranjit Singh, was its secular nature. “His thoshakhana (treasury) was under the charge of a Muslim. He had various Muslim and Hindu ministers. Every chapter, I see the hammer of secularity – fresco, art, architecture….This work is about secularity. “It was never a Sikh empire, but a secular kingdom. The word Sikh empire comes from the British, not the Sikh documents,” he says. Moving forward, Amardeep plans to plough back the money raised from the sale of the hard-bound book to produce a cheaper print version for the masses. To see and hear Amardeep Singh speak this morning about this journey of “love” was wonderful. Thank you Amardeep. Hope you will come back to Malaysia and speak to us again. Tq. Kuldip Singh s/o Durbara, Petaling Jaya.